CNN host Sarah Cupp on Sunday criticized Fox News hosts for "suspend[ing] suspicion" by not running hard enough with the Russian collusion hoax and compared them to date rapists slipping their audience a "roofie" to hide supposed Trump-Russia ties. 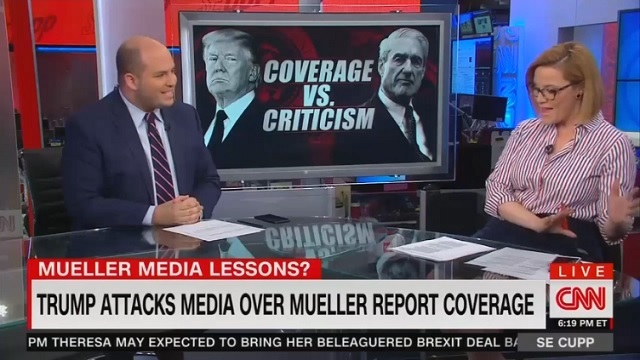 CNN' Brian Stelter backed Cupp up by saying the media should not "apologize to Trump" because "there's no such thing as media." "Everybody has their own version of media," Stelter said. "I would back up and point out that there was a bipartisan consensus about the concern about Russia's attack against the United States." CUPP: So Fox News personalities, it's not surprising, they are insisting that they are the paragons of journalism in that journalism virtue and that they didn't obsess over Mueller the way others did. But my opinion Fox is not the antidote to this problem. It is the sedative. It is like the roofie of this problem. I mean Fox isn't suspicious at all if you can accuse some of being a little too suspicious Fox has suspended suspicion. And so I think Fox is trying to get away with whistling past a graveyard. STELTER: The H word comes to mind, hypocrisy. There's a lot of hypocrisy in the past week from folks who are saying the media should apologize to Trump. Well, first of all, there's no such thing as media, right? STELTER: Everybody has their own version of media. What I read on Facebook, what you read on Twitter, two different worlds, very different worlds, everybody has their own view of media these days. But Fox commentators are saying the mainstream media journalists and news outlets were too interested in this story. I would back up and point out that there was a bipartisan consensus about the concern about Russia's attack against the United States. There was a lot of concern about Trump's lies and Trump world's misleading statements about that attack. There was a lot of reason here to be suspicious. And journalist's jobs are to ask those questions and be suspicious. CUPP: You have to be suspicious, yes. STELTER: Now, a lot of folks on Fox who were attacking mainstream media right now � �mainstream media� -- they are saying that this was a conspiracy theory. Well, some of those folks have also pushed their own conspiracy theories. CUPP: Yes, plenty of them. STELTER: ... about the past two years, about how much focus was there on Trump-Russia versus some of the other policy decisions and issues that are in the news. For the record, tons of Fox News hosts viciously attacked Trump over his epic Helsinki meeting with Putin (Neil Cavuto called Trump "disgusting") and it was mainly just their stars -- Sean Hannity and Tucker Carlson -- who consistently pushed back on this hoax. Fox News is a neocon propaganda outlet which does not want the US to have good relations with Russia. Their only hosts who dare to speak out against our new Cold War are Tucker Carlson and Laura Ingraham.